Mumbai: AirAsia India said it has increased its workforce to 2,000, as the no-frills carrier is set to spread its wings overseas from later this year. Talent recruitment has been one of the key focus areas for the airline since last year, and it will continue to grow to gear up for rapid expansion, AirAsia India said in a statement on Thursday. The Bengaluru-based airline's former managing director and chief executive officer, Amar Abrol, had earlier said that the carrier was aiming a three-fold rise in headcount by 2020. "AirAsia India is proud to achieve another milestone as its employee headcount reaches the 2,000 mark. The airline increased its headcount significantly in the last one year and will continue to grow to gear up for expansion," it said. "The airline has been growing in leaps and bounds. As we continue to grow, talent will be a key quotient for our overall success," said Pawan Setty, head for people and culture, AirAsia India. The carrier has been ramping up its fleet to begin international operations, for which it has to add two more planes as the Indian rules allow a domestic carriers to fly abroad only when it has 20 planes in the fleet. 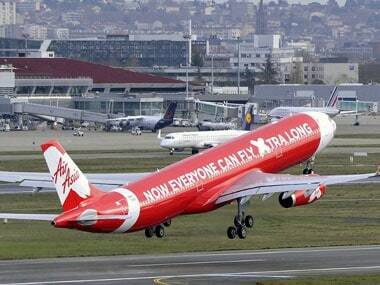 AirAsia India carried 74 percent more passengers at 1.47 million in the March quarter, over the year-ago period. "We had 1,612 employees last year, and we plan to take the number to 2,569 this year and 3,684 in the subsequent year. By 2020, we expect to have 4,834 people working for us," Abrol had told PTI in January.